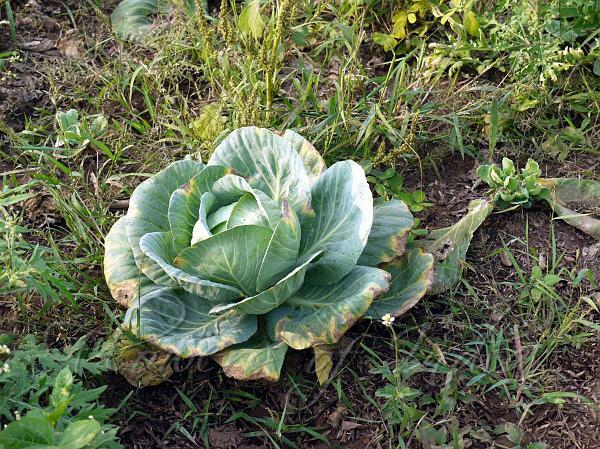 Cabbage usually grows as tightly clustered leaves in a compact "head", and maybe a few loose outer leaves around the base.In warmer weather, it flowers. The head splits open and gives birth to a stalk that uncurls itself as it forces the split head farther open. The stalk grows 2-4 ft tall, then branches and develops numerous small, 4-petaled, cross-shaped yellow flowers that eventually develop into elongate seed pods. There are hundreds of cultivars of cabbage. They can be grouped into three main kinds: smooth green, red and Savoy. The smooth green cabbages may have round, flattened or conical heads, and can be green, blue-green or yellow- green. Head size can range from one pound in some dwarf varieties to more than 27 kgfor some of the kraut cabbages. The red cabbages are reddish- purple and have very tight heads. The Savoy cabbages have crinkled, puckery bluish-green leaves and looser heads. 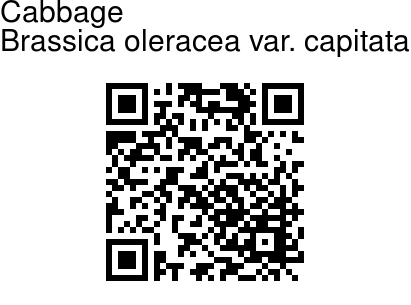 Wild cabbage (Brassica oleracea ssp. oleracea) grows along the coasts in Europe and north Africa. The earliest records of cabbage being cultivated for food come from the Greeks around 600 BC. Today cabbage is grown for food everywhere that plants can be grown.